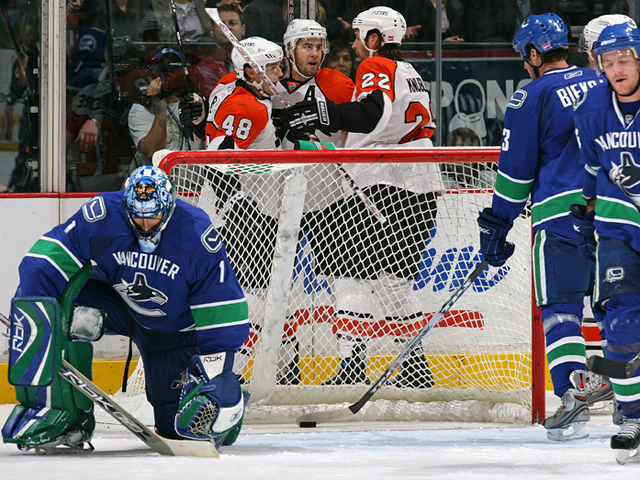 <table width=90% align=center border=0><tr><td><img src=http://cdn.nhl.com/canucks/images/upload/2007/09/henderson_headshot.jpg align=left hspace=4>I’m not a gal who opposes the occasional light spanking, but C’MON!! That was just brutal. I was going to have another brief moan about the stupid NHL schedule, but perhaps a six year interval between Flyers visits is a good thing. And here I was all atwitter to be attending my first game of the season, moving merrily with the mob down Georgia Street in eager anticipation. At one point, I had to make a heads-up deke in order to avoid a hip-check from a woman wearing a Ruutu jersey. Which got me wondering…do fans take on the characteristics of the players whose jerseys they don? Is a guy more likely to get into a bar fight if he’s wearing a Bieksa sweater? If he challenges a guy in a Cooke jersey, will number 24 avoid confrontation and curl up under a table? Speaking of jerseys, I couldn’t believe the number of people in attendance wearing Lindros Philly sweaters. Jeez – did your mommies accidently order those from the Eaton’s catalogue? 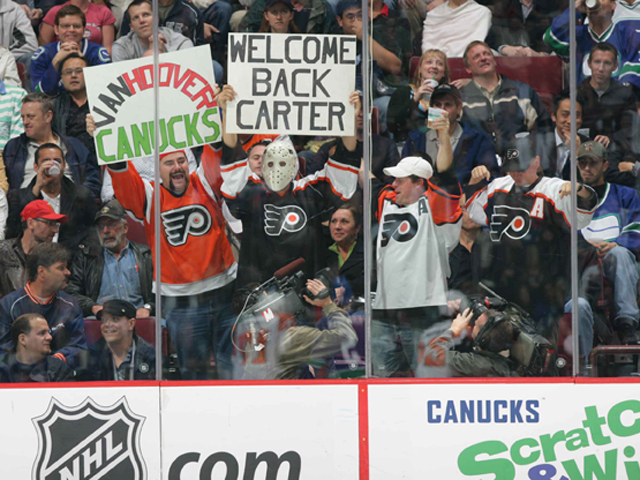 The trade that brought whiney, underachieving Eric to the Flyers quite rightly topped Sportsnet’s all time worst list last week. This is me avoiding talking about the game. Cripes, it was agony the first time – I don’t really want to rehash it. For a hash, it certainly was. Well, the first few minutes looked promising. The boys were forcing the Flyers to the outside, controlling the tempo of the play and vigorously keeping the play alive in the attacking zone.Then came some lazy backchecking where our boys seemed hypnotized by the opposition, sweet Lou let in two goals in a matter of seconds and the wheels came off. During the second period, I was thinking if it were up to me, today I would put the team in the pink jerseys and bag skate them all morning. But by the end, I felt maybe hugs were in order. The lads looked so crushed. I don’t know how the crowd had the heart to boo them – as cruel as kicking a hurt puppy. Trudging home from the game last night, I was thinking, I’m really glad I’m not married to a Canuck. I would be rounding up the kids and sleeping at my mother’s house. But after a night of tossing and turning, I hope the boys return to the ice fiercely motivated not to be so utterly embarrassed at home again. Note to Coach Vigneault – just a thought, but you might want to go over the defensive systems again. There was some terrifically pretty passing last night, interspersed between the vast waves of groaning awfulness. I enjoyed seeing some brief flashes of offensive prowess. But the meat and potatoes of this less-than-superskilled team are the defensive systems. Back to basics, lads, and I think you’ll be okay. We’re only three games into the season. We can probably hold off panicking until, say, game six.